So I got a couple people ask me about this and these are the steps I would recommend, as I learned not to install new drivers on top of old ones the hard way in the past. 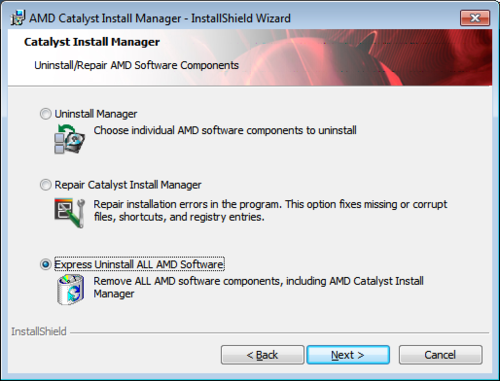 First go to “Control Panel” > “Uninstall a program” then select “AMD Catalyst Install Manager” from the list and hit “Change”. Click “Next” in the popup window and choose “Express Uninstall ALL AMD Software” as seen below. The rest of the process should be automated and you will be prompt for a restart after. Once you have your system started up again, visit AMD.com and look under “Drivers + Support”. You can opt for an installer that automatically detects your card or you can filter the results based on your particular setup, for more on how to determine the model of your video card - see this article by AMD. Once you have the setup package downloaded, run the executable and go through the installation process. Tip: To ensure drivers and any related are completely removed, I'd recommend taking a look at DDU (Display Driver Uninstaller) by "Wagnard". A forum the author set up with version releases can be found here and I found this to be quite a useful utility when troubleshooting any video card - not just AMD based ones.